I’ve been on kind of a Mediterranean kick the last couple days. Soup and salad usually go together but I actually made these on different nights. This evening I made a really wonderful soup. The other day I roasted an eggplant in a hot oven until it was soft and tender. I was thinking maybe baba ganoush would be on my menu soon. But there it sat in the fridge neglected. Tonight I decided to make a soup out of it. I started with a hot pot and a couple tablespoons of olive oil. In went a couple of chopped up onions, salt and pepper. These were sautéed until they were just starting to caramelize. Next I added a good dose of chopped garlic, about 6-8 cloves worth. These were cooked for about a minute or so with the onions. In went a can of diced tomatoes, 2 cans of chicken broth, the flesh of the roasted eggplant, and some seasonings. I added the juice of a lemon, about a teaspoon each of dried thyme and dried oregano, and a healthy pinch of spicy red chili pepper flakes. This was simmered for about 20 minutes until all the flavors were mingling together and the veggies were all well cooked. 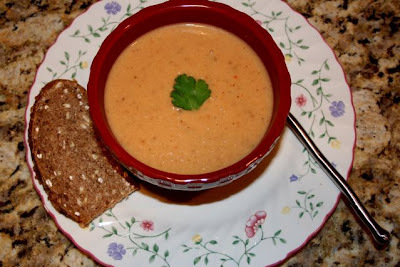 I wanted it to be on the creamy side so I added one can of evaporated nonfat milk. This is a good healthy alternative to adding cream. Of course cream would be over the top better, but this was pretty good. The soup was puréed with my hand blender. All I can say is YUM! The herbs and lemon along with the eggplant and onions. Delicious! Last night started everything off with this Greek inspired salad. This was also very satisfying. I started with a bed of chopped romayne and green leaf lettuces. These were dressed with a lemon, oregano and olive oil dressing. 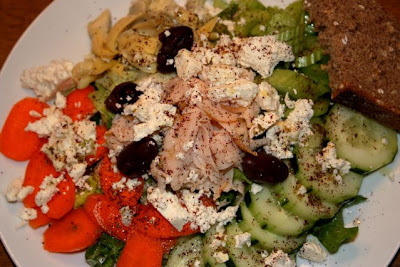 On top are some sliced cucumber, sliced carrots, artichoke hearts, celery, sliced chicken breast, kalamata olives and lots of feta cheese. Another drizzle of the lemon dressing and a dusting of sumac and the salad was ready to go. It reminded me of the lemony greek salads from a local mom & pop shop I used to get when I was a graduate student. Your soup & salad looks great. I love mediterranean food. I can’t get enough of it. I’ve not used roasted eggplant in soup before, so thanks for the idea. I like the sound of this soup. This is almost spooky – I woke up this morning, looked at the eggplants in my fridge, and wondered what eggplant soup would be like… You read my mind!! Your recipe is gorgeous! Thanks for the comments. The soup turned out good. Next time I will probably increase the amount of eggplant and cut the onion down to 1.